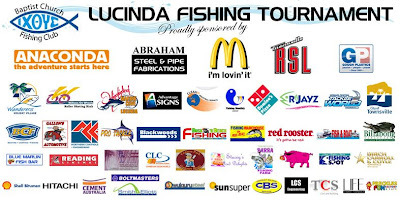 The Baptist Church Fishing Club would like to thank all of the wonderful businesses and organizations presented above for their generous sponsorship of our 10th annual Lucinda Fishing Tournament. Once again this event was a huge success with just under 200 people competing for the massive $5000 prize pool that was shared between 45 prize categories. In particular, we would like to thank our major sponsor ANACONDA for their generous donation of prizes to the value of $1000. We would also like to acknowledge the significant sponsorship provided by Abraham Steel and Pipe Fabrications, Townsville RSL, McDonalds and Gough Plastics – your support of our major divisions is greatly appreciated. Also a big thanks to Mark Chester and his team at Advantage Signs for an amazing job on our signage - you guys are truly a pleasure to work with. THANK YOU again to all our valued Sponsors and for your ongoing support and investment in this great event that brings families and friends together through fishing.